The Harmony Project of America is a national program that provides full-scholarship music education and instruments on loan to low income students. The project was launched in Long Beach this school year as part of the Safe Neighborhood Initiative from the Long Beach Police Department in partnership with the Long Beach Education Foundation. Long Beach Unified School District and community partners. Students are immersed in music 5 hours per week including after school and on Saturdays. Instruction includes theory, musicianship, singing, movement, art, character development and the in-depth study of their chosen instrument. Students are instructed on violin, viola and cello. Harmony Project Founder Margaret Martin did not let her life challenges including teen pregnancy and parenting, domestic violence and homelessness with her two children, to enroll at LA City College as a freshman at the age of thirty-three. Martin went on to earn a doctorate in Public Health from UCLA in ‘Community Health Science’, and a master of public health degree, also from UCLA, in Behavior Science/ Health Education, and Population and Family Health. She founded Harmony Project in 2001. Palacio Magazine Publisher and Executive Editor Antonio Ruiz interviewed Martin during a noisy reception after a planning meeting. While the Long Beach Unified School provides the teachers and musical instruments, there are other support costs that must be raised. 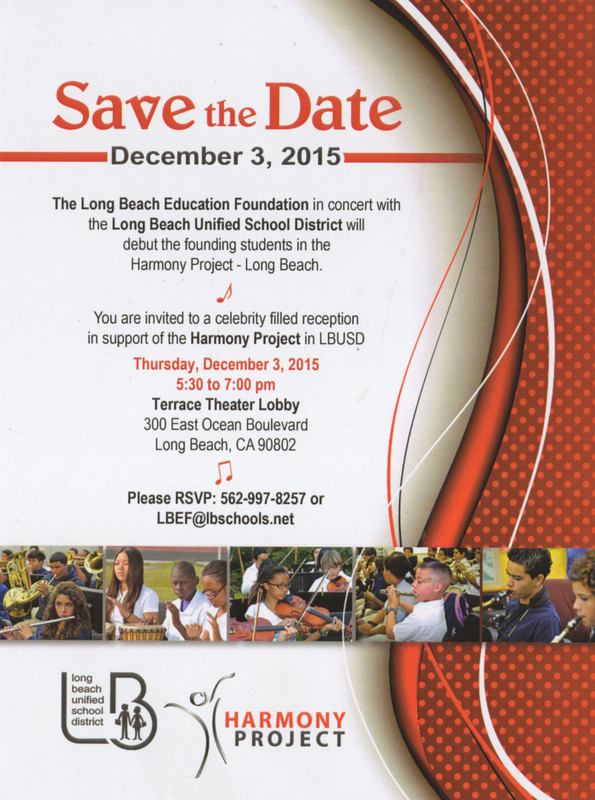 The Long Beach Education Foundation in partnership with LBUSD has scheduled a special event on Thursday, December 3rd to debut the founding students in the Harmony Project-Long Beach. The reception in support of the Harmony project will be in the Terrace Theater Lobby, 5:30 to 7:30 pm, 300 East Ocean Blvd. You can RSVP by calling 562-997-8257 or email LBEF@lbschools.net. For more information on The Harmony Project of America, visit there website HERE. 2009 Coming Up Taller Awards, presented by First Lady Michelle Obama in the State Dining Room of the White House, Washington, DC.